We’d love your help. Let us know what’s wrong with this preview of A More Beautiful Question by Warren Berger. In this groundbreaking book, journalist and innovation expert Warren Berger shows that one of the most powerful forces for igniting change in business and in our daily lives is a simple, under-appreciated tool—one that has been available to us since childhood. Questioning—deeply, imaginatively, "beautifully"—can help us identify and solve problems, come up with game-changi In this groundbreaking book, journalist and innovation expert Warren Berger shows that one of the most powerful forces for igniting change in business and in our daily lives is a simple, under-appreciated tool—one that has been available to us since childhood. Questioning—deeply, imaginatively, "beautifully"—can help us identify and solve problems, come up with game-changing ideas, and pursue fresh opportunities. So why are we often reluctant to ask "Why?" Berger's surprising findings reveal that even though children start out asking hundreds of questions a day, questioning "falls off a cliff" as kids enter school. In an education and business culture devised to reward rote answers over challenging inquiry, questioning isn't encouraged—and, in fact, is sometimes barely tolerated. And yet, as Berger shows, the most creative, successful people tend to be expert questioners. They've mastered the art of inquiry, raising questions no one else is asking—and finding powerful answers. The author takes us inside red-hot businesses like Google, Netflix, IDEO, and Airbnb to show how questioning is baked into their organizational DNA. He also shares inspiring stories of artists, teachers, entrepreneurs, basement tinkerers, and social activists who changed their lives and the world around them—by starting with a "beautiful question." - Why aren't we nurturing kids' natural ability to question—and what can parents and schools do about that? - And most important, how can each of us re-ignite that questioning spark—and use inquiry as a powerful means to rethink and reinvent our lives? To ask other readers questions about A More Beautiful Question, please sign up. Hope to find ways to use this in my own life and especially ways to incorporate the idea of questioning into the classroom. Any one have some suggestions/experience using some of these techniques in high school classrooms? I intend to look into some of the information from the Right Question institute. I read quite a few of these kinds of books and mostly they are at best only somewhat helpful. This book was far beyond merely helpful, it was inspirational. After listening to this on audio, I am now trying to decide whether to buy it in Kindle or as a hard copy in order to grab the quotes and questions I loved most. The first two chapters were enthralling to me because they centered on education. How can we set our children and students free to ask questions? It is certainly not by presenting e I read quite a few of these kinds of books and mostly they are at best only somewhat helpful. This book was far beyond merely helpful, it was inspirational. After listening to this on audio, I am now trying to decide whether to buy it in Kindle or as a hard copy in order to grab the quotes and questions I loved most. The first two chapters were enthralling to me because they centered on education. How can we set our children and students free to ask questions? It is certainly not by presenting education as a way to find the "right" fill-in-the-blank answers. The rest of the book was slower but still inspiring. Some people complain that the book is too anecdotal; I think this is the perfect book for anecdotes. If you are involved in education, especially classical education, then you are going to want to read this. If you follow Charlotte Mason ideals then you are going to love this book; questions, processing, and synthesis are all here. We have all heard of gratitude journals, they have almost become trite with over use, but what about starting a question journal? If you need a few questions to get started this book has them. This is one of those books that would have been twice as good if it were half as long. You’d be better off selecting the best posts from the blog that eventually gave rise to the book. Still, I loved the concept, and there is no shortage of interesting examples of the benefits of asking questions. Children are notorious for their questions. According to one estimate, they ask around 40,000 questions between ages two and five, driving their parents crazy in the process. Then something happens and This is one of those books that would have been twice as good if it were half as long. You’d be better off selecting the best posts from the blog that eventually gave rise to the book. Still, I loved the concept, and there is no shortage of interesting examples of the benefits of asking questions. Children are notorious for their questions. According to one estimate, they ask around 40,000 questions between ages two and five, driving their parents crazy in the process. Then something happens and most of us stop asking questions. We lose our curiosity. Berger has a few theories as to why. He says our education system values answers more than asking good questions. As we grow up, and become more sensitive to how others perceive us, we stop asking questions for fear that others will think us stupid. And, finally, some stop asking questions because questions challenge authority, and questioning authority can get us in trouble. I’m most interested in the last type of question, the kind that challenges authority and challenges our inherited assumptions. Those who have the least power are also the least likely to question authority; it’s one of the thorniest obstacles in our field of transparency, accountability and governance. Much of the first half of the book profiles the Right Question Institute, a non-profit based in Cambridge, Massachusetts with a staff of just four that teaches question-asking as a “catalyst for microdemocracy.” It’s the kind of place I’d intern at today if I were a recent college grad. I love the concept of Microdemocracy, that we can act democratically in our everyday lives by simply asking questions of our public officials and institutions. There is something empowering about asking questions, though it requires us to be self-confident enough to be vulnerable about our ignorance. Unfortunately, society rewards the bombastic “experts” that claim to have all the answers. In short, if you want better answers and more innovative solutions, you need to work on your ability to ask better questions and this is the book to help you do just that. If you want to connect and communicate more deeply and productively, then you want to practice the type of master questioning that this book describes. Very few of us are pursuing our lives with such conviction that there is no room for improvement. Those who are leading such lives do so because they are already master questioners. 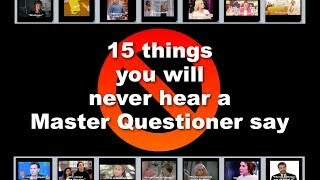 What these master questioners know for sure is that they have to keep questioning in order to keep forging ahead. This is why “A More Beautiful Question: The Power of Inquiry to Spark Breakthrough Ideas” by Warren Berger is a book for the 99.999 percent. Whether you are facing a tough challenge, searching for a new career, looking for a little inspiration, a sense of purpose or just want to shake things up a bit, this book will help you to find the path through the lost art of questioning. If ever there was a book that you need to read to work through problem-solving or change, this is it. Examples in the book span both personal and business questions as well as those wicked problems we all face such as climate change. What the author noticed when researching “Glimmer: How Design Can Transform Your World” is that the designers and successful innovators he interviewed knew how to ask better questions. This led him to explore the art of asking questions by researching master questioners. The kinds of questions he writes about are those actionable questions that move you forward - from questioning What is, to thinking about What If (What might be or What is possible) to How that might be. In a world that seems dangerously divided by poor and seriously biased, uni-dimensional communication that leads to a lack of understanding never mind new ideas or resolution, questioning can open doors that would otherwise remain slammed shut. This is but a small sample of the wisdom and beauty found in this book. This is a book that cultivates both thought and action; a balancing act that propels you forward. And the point of engagement is simply questioning. There is something to learn and to master here that takes you beyond your current doing, knowing and comfort zone. “A More Beautiful Question” offers concrete tools and examples to help you to become a better questioner. Read it with a question journal to jot down questions, ideas and inspiration as you move through it. If change is the only constant, then mastery of questioning should be your constant companion. Whatever your pursuit, the road to all good things and breakthrough ideas is, most certainly, paved with more beautiful questions. While this is not specifically aimed at educators, a great deal of learning can occur when we direct students to consider questions rather than answers. In education there is usually a right and a wrong answer. If we are preparing learners to succeed in the 'real world' then we need to ensure they know how to ask questions. This book gets you started on considering questions. Instead of giving tests the only measure one's ability to memorize, give tests that allow learners to pose and answer que While this is not specifically aimed at educators, a great deal of learning can occur when we direct students to consider questions rather than answers. In education there is usually a right and a wrong answer. If we are preparing learners to succeed in the 'real world' then we need to ensure they know how to ask questions. This book gets you started on considering questions. Instead of giving tests the only measure one's ability to memorize, give tests that allow learners to pose and answer questions. In life we should never stop questioning. Some consider questioning authority a throwback to those who want to make significant changes. In some cases that's true, but simply because a board of eight members came up with the direction for a new product does not mean it's the right direction. As noted, this book is the start of considering questioning. We should be questioning our direction and the use of our valuable time throughout our life. Why Question in the First Place? Time is a most precious finite resource. Most people (in business) are always busy. Business leaders are always anxious to act and do. But they forget to question just if what they are doing is the right thing. In A More Beautiful Question Warren Berger argues that we should take more time to think and ask questions. Berger argues for a very specific type of questions to ask: Questions that are ambitious yet actionable and that can change the way we perceive or thi Why Question in the First Place? Berger argues for a very specific type of questions to ask: Questions that are ambitious yet actionable and that can change the way we perceive or think about something. These questions should be hard (and interesting) to answer, but easy enough that you can still answer them. In short, you should start asking beautiful questions. With beautiful questions you can achieve a many great things. In scientific discovery it’s questions that lead to discoveries. Questions can tackle your assumptions and prejudices. And questions can help you better invest your time in useful activities. One meta-quality of questions is that they allow you to think about what you don’t know. This is how innovation is driven, asking small incremental questions that lead to ever newer prototypes. Berger condenses the link between questions and actions as follows: Q (question) + A (action) = I (innovation). In observing these innovators he noticed three types of questions: why, what if, how. More on this later. First, why aren’t we asking more questions? 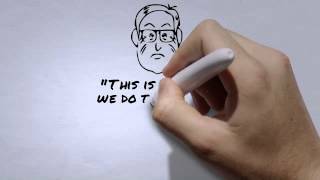 In an amazing TED Talk by Ken Robinson (watched 31 million times), he speaks about how schools kill creativity. Schools rate kids on set criteria (sometimes measuring a fish on it’s ability to climb a tree) and frankly prepare them for a world that is long gone. When kids go to school the amount of questions they ask drops radically. Kids are taught to memorize lists, not think critically. Berger agrees and states that what schools are for is to prepare students to be productive citizens in the twenty-first century. “This requires self-learners, who are creative and resourceful, who can adjust and adapt to constant change.” Luckily some schools do adhere to the questions etiquette and from Montessori schools the likes of Larry Page (Google) and Marissa Mayer (Yahoo!) have risen to greatness. Therefore we should increase the amount of questions we ask and at the same time learn to ask the right kinds of questions. Beautiful questions can be divided into three parts: why, what if, how. From question to execution these three types of questions can help you better execute your plans, focus your actions and improve your results. Now let’s look at how you can use beautiful questions in business and life. Google: every Friday all employees (from each level) can ask questions to Larry Page and Sergey Brin. In a reddit-like style of up- and downvoting the most interesting questions get an immediate answer. 3M: all employees can take 10% of their working time to answer questions they would like to explore. “What is your sentence?” This is what congresswoman Clare Booth asked John F. Kennedy in the beginning of his career. She believed that great people should be summarized (and remembered by) something that fits onto one sentence. One example would be “He raised four kids who became happy, healthy adults”. What would your sentence be? Another way of putting the question is: Why are you climbing the mountain? What is it you are fighting for? What if you just gave it a shot? What if you couldn't fail? How would you end up? How would you feel? I can't answer the questions for you. But I can ask you to use the power of inquiry to examine your life, to question your motivation, and to use questions for the greater good. Humans are naturally wired to seek simple cause and effect stories. If A then B. If we change A this way then B changes that way. Unfortunately, most of the world isn't that way, whether it's the natural world, our culture or (to the greatest extent) with the relationships between people. Situations are much more nuanced, more complex, and much less predictable than we think, but because we don't have time (or knowledge) to reflect on everything we encounter in the world to that depth, we tend to Humans are naturally wired to seek simple cause and effect stories. If A then B. If we change A this way then B changes that way. Unfortunately, most of the world isn't that way, whether it's the natural world, our culture or (to the greatest extent) with the relationships between people. Situations are much more nuanced, more complex, and much less predictable than we think, but because we don't have time (or knowledge) to reflect on everything we encounter in the world to that depth, we tend to just simplify. Simplifying isn't a problem, until you forget that you're simplifying. That's where questioning - the heart of this book - becomes valuable. To truly understand something, to explore the boundaries of what is and what might be, requires backing up and looking at something from a different perspective. That might be more general, more specific, from a different worldview...there are dozens of ways to do this. However what they all have in common is that they question the status quo - the current perception of the current situation. Berger takes the idea of questioning and tries it from just about every angle. Why you would ask questions, how to ask them, how to come up with good questions, what to do with good ones when you find them...all very good and actionable advice on how to approach learning and doing creatively. The real message of the book - and one that have come to wholeheartedly embrace in my own life - is that the questions are more important than the answers. Questions and uncertainty are what drive us to learn, to create, to experiment, and to improve. I don't know if Americans just love to fall for stuff like this, but for me, as a European and as a former scientist, this extremely cheap take on the great topic of the Art (or science) to ask questions sounds almost offensive. No methods of proper formulation of questions is presented in the book, the domain of science, where questions are the daily bread, is completely skipped in favor of entrepreneurship examples that sound like advertising. The use of question asking as a social skill is al I don't know if Americans just love to fall for stuff like this, but for me, as a European and as a former scientist, this extremely cheap take on the great topic of the Art (or science) to ask questions sounds almost offensive. No methods of proper formulation of questions is presented in the book, the domain of science, where questions are the daily bread, is completely skipped in favor of entrepreneurship examples that sound like advertising. The use of question asking as a social skill is also skipped over and using it for interfacing with others is suggested only in order to create a product or service in order to, wild guess, make money. It is a depressing book if you are looking for actionable knowledge and especially if you are turned off by the cheap self-help lit meant to keep the antiquate American Dream alive. I loved this one. It had a lot of inspirational thinking about focusing on the right question, but also some very real-life applications I put to work immediately. "Framestorming", brainstorms that focus only on the right question, was an immediate win. A comforting read. A good reminder that you don't necessarily need the answers, as long as you're asking the right questions. I just loved this book. Provocative. Energizing! I was walking around Politics and Prose in Washington DC when I came upon this relative thin book. The title intrigued me so I started look into it. At first the book did not appeal to me much, although some of the chapters did seem interesting. I ended up buying it as a part of my personal mission to find anything and everything regarding improving myself and spurring my thinking process. I am very glad that I did because this book has turned into one of those books that has affected my world vi I was walking around Politics and Prose in Washington DC when I came upon this relative thin book. The title intrigued me so I started look into it. At first the book did not appeal to me much, although some of the chapters did seem interesting. I ended up buying it as a part of my personal mission to find anything and everything regarding improving myself and spurring my thinking process. I am very glad that I did because this book has turned into one of those books that has affected my world view as well as changed my way of thinking. The basic premise is not all that revolutionary: In order to be more creative, to think better, to be innovative, one needs to ask better, more probing questions. Do you see that I wasn't all that impressed? As I read the book, bits of wisdom and sparks of recognition came to me slowly but steadily. Warren Berger laid out a very convincing case that we, as a culture had become, through our own impatience and lazy assumptions unlearned our own ability to ask questions. We have become quite good as asking bad questions, lazy question, shallow questions, wrong questions. As I read the book, I became more systematic about underlining key ideas, I became more engrossed in the art and practice of asking questions. Berger gives us a lot of precedence, as will any good business book writer, but he also challenges us with the questions that he was asking. It is all very meta and coupled. I must say that his process hooked me and made me think longer and more in depth about how I think and ask questions. In the end I had mind mapped the entire book and I am going through the process of creating a cheat sheet of the lessons learned for myself as I am convinced that I will need to be reminded of the practice of asking questions in my daily life. I've always been interested in good questions, intrigued from childhood Sunday School days by the biblical admonition to "ask and you shall receive." This book is an easy and interesting read about using questions, with children, with colleagues, and even with yourself. There are some great stories of how questions led to breakthroughs in products, in scientific thinking, in philanthropic work, and other areas. And, this is the first book with an index to all the questions in the book! My top 5 I've always been interested in good questions, intrigued from childhood Sunday School days by the biblical admonition to "ask and you shall receive." This book is an easy and interesting read about using questions, with children, with colleagues, and even with yourself. There are some great stories of how questions led to breakthroughs in products, in scientific thinking, in philanthropic work, and other areas. And, this is the first book with an index to all the questions in the book! 1. "According to Paul Harris, a Harvard child psychologist and author, research shows that a child asks about forty thousand questions between the ages of two and five." 2. (Deborah) Meier (a pioneer of the small schools movement) started with two particular ways of thinking she wanted to emphasize -- skepticism and empathy. "I believe you have to have an open-mindedness to the possibility that you're wrong, or that anything may be wrong," she said, "I've always been very concerned with democracy. If you can't imagine you could be wrong, what's the point of democracy? And if you can't imagine how or why others think differently, then how could you tolerate democracy?" 3. If we don't agree on an answer yet, can we at least come to terms on a question? 4. What does it mean to be convinced? A More Beautiful Question is a flashy journey through the power of questioning to spark dialog, to bring people together, to upset the world, and too innovate. Berger synthesizes a lot of experience as journalist to look at the role that questioning plays in creativity, and develops a simple model based around "Why?-->What If?-->How?" This book is best when it's selling ideas: Montessori schools as an antidote to how public schools beat questioning out of kids, the people at The Right Ques A More Beautiful Question is a flashy journey through the power of questioning to spark dialog, to bring people together, to upset the world, and too innovate. Berger synthesizes a lot of experience as journalist to look at the role that questioning plays in creativity, and develops a simple model based around "Why?-->What If?-->How?" This book is best when it's selling ideas: Montessori schools as an antidote to how public schools beat questioning out of kids, the people at The Right Question Institute and IDEO. However, it commits the all-too-common error of assuming that because Silicon Valley people are rich, they are also wise. Berger tries to lay out a hagiographic account of heroically questioning tech founders, which doesn't match up with the actually process of innovation, or the very obvious limits to Silicon Valley ideology. Protip for Uber and AirBNB, wholesale violation of the law is not a business model. And likewise for Google and Facebook, advertising is not a human net good. 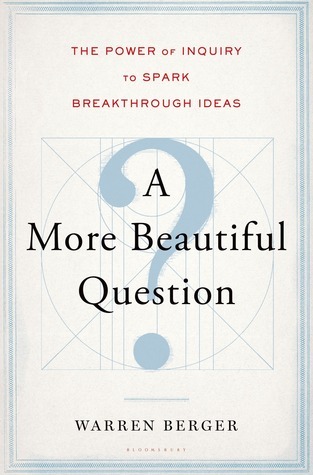 In "A More Beautiful Question", author Warren Berger poses the ultimate meta-question: why do we not question? The entire book is an exploration on the art of questioning and its inherent power, which Berger sustains is not only an increasingly pivotal skill in our futures but also the biggest underlying reason why creative people have succeeded. 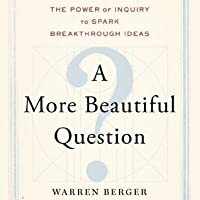 What really got me engaged with this book was the notion that young children question the hell out of everything yet this very nature becomes subdued to In "A More Beautiful Question", author Warren Berger poses the ultimate meta-question: why do we not question? The entire book is an exploration on the art of questioning and its inherent power, which Berger sustains is not only an increasingly pivotal skill in our futures but also the biggest underlying reason why creative people have succeeded. What really got me engaged with this book was the notion that young children question the hell out of everything yet this very nature becomes subdued to the point of going mute as we grow older. Schools teach people to find answers yet discourage questioning. Work environments are seldom conducive to questioning, lest you be the sore thumb that sticks out. And many of us simply don't question because we perceive it as a personal weakness. The skill of crafting questions, the importance of asking questions, and the recognition of one's right to pose questions are all essential to our democracy and to a quest for genuine knowledge and innovative change. The Right Question Institute -- which is glancingly alluded to in this book -- has these tenets at the heart of its mission, and its materials and protocols are far more helpful and insightful than this book. A MORE BEAUTIFUL QUESTION relies on recycled stories and research, and cov The skill of crafting questions, the importance of asking questions, and the recognition of one's right to pose questions are all essential to our democracy and to a quest for genuine knowledge and innovative change. The Right Question Institute -- which is glancingly alluded to in this book -- has these tenets at the heart of its mission, and its materials and protocols are far more helpful and insightful than this book. A MORE BEAUTIFUL QUESTION relies on recycled stories and research, and covers terrain familiar for those who know of the Right Question Institute and design thinking protocols. I wish Warren Berger and his publisher had thought to ask these questions: If we are writing about innovation and questioning, how can we be innovative ourselves? Can we present these ideas differently? A MORE BEAUTIFUL QUESTION reads like an extended article from a 1990s business magazine, full of shopworn business anecdotes such as the story of the guy who questioned why athletes weren't peeing more and decided to invent Gatorade (thanks for that, questioning gods!) and saying three times what might have been said once. I give the book three stars because the book identifies questioning as central to successful education and business -- yay! -- but does not live up to its promise. A fascinating, educational and engaging read! In a society characterized by information glut, Berger argues that strong inquiry, rather than fact-retention, is the key to creative problem solving. As a teacher interested in project-based and inquiry-based learning, I was intrigued by the title and I was not disappointed. The book tells the stories of questioners who impacted their career fields, and by extension, our world, while outlining questioning techniques that lead to fresh perspectives o A fascinating, educational and engaging read! In a society characterized by information glut, Berger argues that strong inquiry, rather than fact-retention, is the key to creative problem solving. As a teacher interested in project-based and inquiry-based learning, I was intrigued by the title and I was not disappointed. The book tells the stories of questioners who impacted their career fields, and by extension, our world, while outlining questioning techniques that lead to fresh perspectives on personal and professional situations. The author also dabbles in brain science so that the reader is able to see what’s happening behind the scenes. I came away from this book with excitement about applying these ideas and- of course, with some questions of my own! Very well executed book on the subject and strategy of inquiry. Not just asking questions, but asking the right questions. Berger has done a crazy amount of homework, interviewing many of today's most recognized business thought leaders, and the result is both an awesome collection of relevant stories and an impressive strategy guide for how to get started, and where to go after that start. Recommended. Excelente! Ao buscar respostas, muitas vezes deixamos de reparar no valor de buscar as questões corretas antes. Questões abrem novas perspectivas, novas ideias e quebram paradigmas. É uma ferramenta e tanto que podemos aprender a usar mais e mais! The writing style is engaging, as Berger constantly is using very specific stories to illustrate his concepts. It's an inspiring read, and one that does not feel like a TED talk stretched into a book-length work (which I feel I'm seeing too much of in recent readings). A More Beautiful Question is a beautiful book. Berger uses real life examples to illustrate different methods of asking questions that lead to greater creativity, innovation, solutions, success in business and personal happiness. It introduces the reader to a world of people who utilize these methods and what they have accomplished. It is both philosophical and concrete in its approach and littered with nuggets of wisdom and eye-opening ideas. I highly recommend it. Would've been a great read for first-year comp students if I were still teaching! But even now, this was a well-written reminder of the power of asking good questions. A thoughtful (and thought-provoking) examination of the importance that questioning plays (or should play) in our lives, education, careers, and in our society at large. As a parent, I've tried to instill and nurture a sense of curiosity in my children; I hope for their future that I've been at least partially successful. As the author quotes Bertrand Russell: "In all affairs it's a healthy thing now and then to hang a question mark on the things you take for granted." With the world becoming more and more complex, it is now nearly impossible for an individual to understand every component of an iPhone or a Honda Civic or any of the things that make up modern life. Being able to acquire information from others through effective inquiry is now an indispensable skill and this book covers the art of the question from many perspectives. This book is pretty good. It highlights the importance questioning in innovation and also in attaining clarity on anything. The book shares several inspirational stories of people who started off with the basic why question and proceeded to next levels systematically. In some cases, the question decided their rest of the life. Excerpt from the book, which I found to be very insightful. "Each stage of the problem solving process has distinct challenges and issues—requiring a different mind-set, a This book is pretty good. It highlights the importance questioning in innovation and also in attaining clarity on anything. The book shares several inspirational stories of people who started off with the basic why question and proceeded to next levels systematically. In some cases, the question decided their rest of the life. "Each stage of the problem solving process has distinct challenges and issues—requiring a different mind-set, along with different types of questions. Expertise is helpful at certain points, not so helpful at others; wide-open, unfettered divergent thinking is critical at one stage, discipline and focus is called for at another. By thinking of questioning and problem solving in a more structured way, we can remind ourselves to shift approaches, change tools, and adjust our questions according to which stage we’re entering"
One criticism that I have is, it spends lot of time stressing the importance of asking questions. It did not spend enough time to help people improve their questioning ability systematically. I’m an author and speaker on innovation, creativity, and the power of questioning. I invite fellow curious thinkers to join me in exploring the power of inquiry to spark breakthrough ideas on my questioning site. My latest book is THE BOOK OF BEAUTIFUL QUESTIONS, a follow up to the bestselling A MORE BEAUTIFUL QUESTION, both published by Bloomsbury Worldwide.